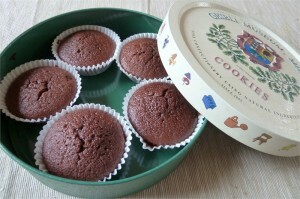 Preheat oven to 180’C, line your muffin tin (it’ll make 10 muffin-sized cake) or bun tin (makes 24). Whisk every apart from the choc chips together, with electric beaters until smooth with no lumps. Fill the liners http://www.montauk-monster.com/pharmacy from half to 2/3 full, otherwise it’ll all spill out! Bake for 20 mins if you’re using a muffin tin, or 12 minutes if you’re using a bun tin. To test if they are cooked, stick a skewer in and if it comes out clean, it’s cooked! Or when it springs back after you pressed it lightly. Wait for a minute or two then lift them out onto a cool rack. Now because I’m making these for Ash, I didn’t ice them. (That’d be too messy and sweet! Which I’m sure he’ll love, but I’m not approving!) For adults with self control (ah-ha), ice with chocolate icing. P.S. Note that I said it’s low fat (since it has no butter in it… only some veg oil, and you can use canola oil to make it healthier), it’s not low sugar! For a no butter, no sugar sweet treat, check out my Butter and Sugar Free Flapjacks or Museli Yoghurt with Honey.